Visit our photo gallery with selected highlights from the 11th Congressional District special election here. Our cameras were all over the District – we have lots more great shots here. Republican/Conservative/Independence Parties candidate Dan Donovan and Democratic/Working Families Parties candidate Vincent Gentile each voted this morning, with the press in attendance. Each spoke with the press after voting and we have their full press gaggles. Green Party candidate James Lane does not live in the district and is therefor not able to vote in today’s election. Donovan was joined by his fiancé, Serena Stonick, in the Rosebank section of Staten Island. Among Donovan’s comments: he voted for himself (but did not reveal which line), he’s “very optimistic”, low turnout is due to the unusual May date and not the circumstances around Michael Grimm’s resignation, he’s been “very blessed” by the voters of Staten Island and his campaign was “uplifting”. Gentile voted at his alma mater, Fort Hamilton High School. Among Gentile’s comments: Donovan would be part of an “anti-New York City agenda” as part of the House Republican conference, Gentile knows Staten Island well from representing part of the borough during his three terms in the state senate and this is a “homecoming on Staten Island, not an introduction”, he’s a “Brooklynite” but considers himself an “adopted son” of Staten Island, the Garner case showed Dan Donovan to be “not upright” and “not an advocate” who “took a back seat” and he’s satisfied with the support he’s received from other Democratic elected officials. The 11th Congressional District special election tomorrow has posed a fundamental challenge for the candidates – getting voters attention and making them aware of the occurrence of the election. With the campaign ending, I asked Democratic candidate Vincent Gentile about the level of awareness among voters he’s encountered. We spoke as Gentile campaigned outside a grocery store in Graniteville. 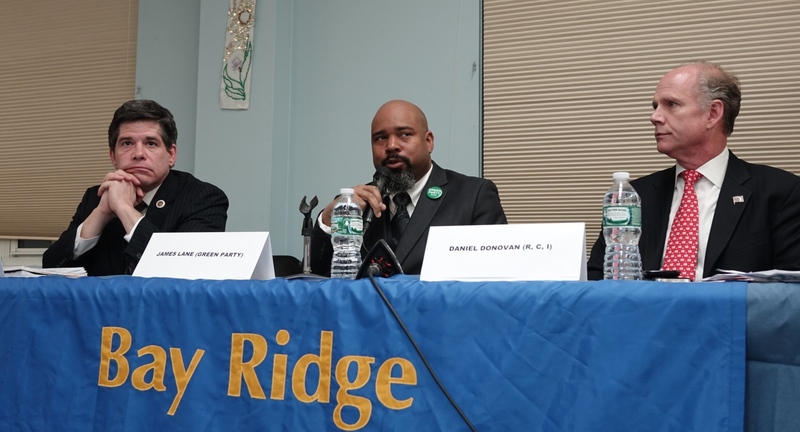 Democratic Party candidate Vincent Gentile and Green Party candidate James Lane participated in a candidate debate Wednesday in Bay Ridge. Republican/Conservative/Independence Parties candidate Dan Donovan was invited but did not attend. 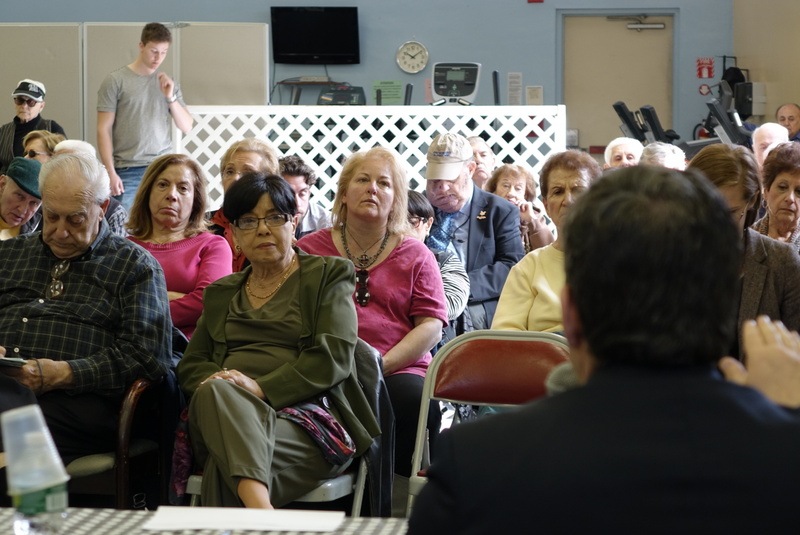 Hosted by the Bay Ridge Council on Aging at the Fort Hamilton Senior Center, the debate also included a self-described write-in candidate, Tom Weiss, despite the moderator’s efforts to limit the debate to Gentile and Lane. The candidates face a May 5th special election to fill the 11th Congressional District seat vacated by Michael Grimm. Why Are We Married To Staten Island? So said one of the audience members questioning, and complaining about, the inclusion of a slice of southern Brooklyn in the Staten Island-dominated 11th Congressional District. It’s a reverse of the more common refrain from Staten Islanders who often feel politically neglected and marginalized. Neither Democrat Vincent Gentile nor Green Partier James Lane quite got it right in their response, however. Gentile was reasonably close, noting that the state legislature, not congress, is responsible for drawing district lines. He omitted the fact that the current lines were actually drawn by a court-appointed expert as part of a federal lawsuit in 2012, however, and that the 11th district is a reasonable, coherent district. Lane lamented the process and effects of gerrymandering without appearing to know that it’s not an accurate description of how the current congressional district lines were drawn nor of the composition of the current congressional districts. Democratic candidate Vincent Gentile has received little outside support so far as he campaigns toward a May 5th special election. The 11th Congressional District seat he’s seeking is widely regarded as likely to stay Republican despite former Rep. Michael Grimm’s guilty plea to federal tax evasion and subsequent resignation. 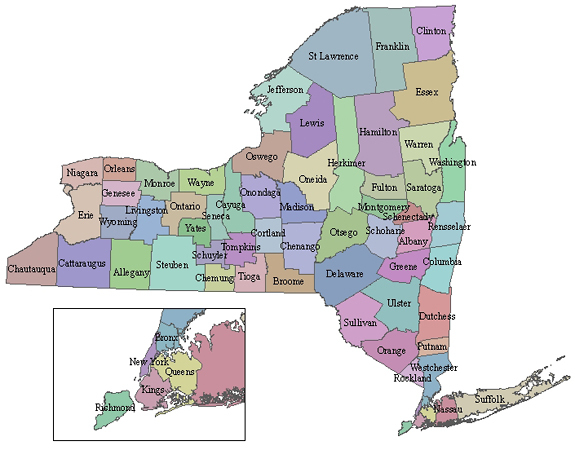 Democrats have had some recent success there, however, with Andrew Cuomo winning the district this past November and Barack Obama winning Staten Island (which comprises most of the district) in his 2012 reelection. Neither has given any visible support to Gentile. With Cuomo’s significant 2014 margin of victory in the district his support could be meaningful for Gentile. In February, on the day that Cuomo set the election date and before Gentile was selected as the Democratic candidate, Cuomo suggested that he would not get involved in the race and offered kind words about Republican Dan Donovan. Here is our photo gallery from New York’s most recent congressional candidate debate. The Bay Ridge Council On Aging hosted a debate this morning featuring candidates in the 11th Congressional District special election. The May 5th special election will select a successor to former Congressman Michael Grimm in a district which includes all of Staten Island and a crescent shaped slice of southwestern Brooklyn. 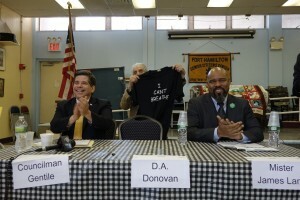 The debate, held at the Fort Hamilton Senior Center in Bay Ridge, included Democratic Party candidate Vincent Gentile and Green Party candidate James Lane. 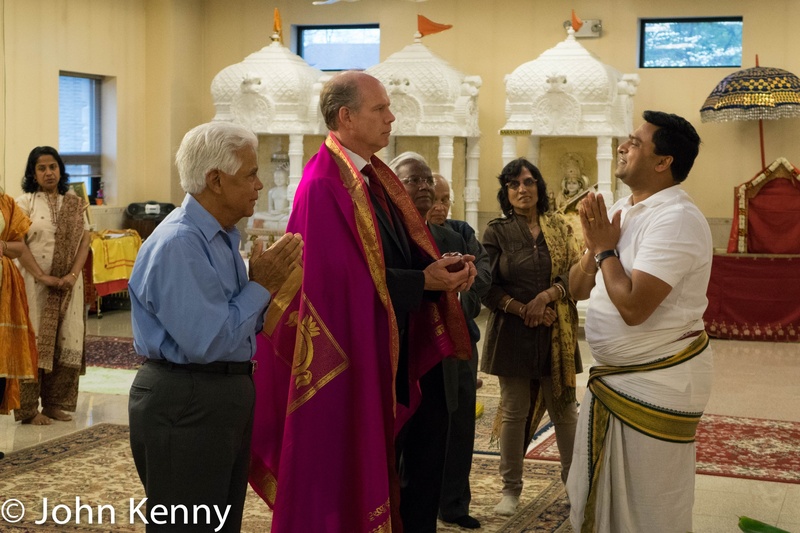 Republican/Conservative/Independence parties candidate Dan Donovan was invited but did not attend. His absence drew considerable condemnation from Gentile and Lane. A self-described write-in candidate, Tom Weiss, was not invited but nonetheless participated despite repeated objections from the moderator. 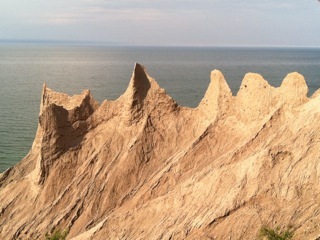 Click here for our photo gallery. NY1 and the Staten Island Advance hosted an 11th Congressional District candidate debate Tuesday evening between Republican Dan Donovan and Democrat Vincent Gentile. Held at the College of Staten Island, the debate topics ranged from whether the candidates have ever smoked marijuana to how to deal with Israel, Iran and the deep issues raised by President Obama’s recent executive orders on immigration. Both candidates spoke with the press following the debate. During a candidate debate hosted by NY1 and the Staten Island Advance Republican Dan Donovan appeared to not know the federal minimum wage. His Democratic opponent, Vincent Gentile, asked him that question during a “cross examination” portion of the debate (at about 31:00). When asked about it during a post-debate Q&A with reporters, Donovan denied hearing the question as posed. Gentile: Here’s what Gentile had to say about his minimum wage question and Donovan’s response when speaking with reporters after the debate. The race to succeed Michael Grimm moved ahead Tuesday evening as three candidates met for a sharp, sometimes raucous debate. Democratic Party candidate Vincent Gentile, Green Party candidate James Lane and Republican/Conservative/Independence parties candidate Dan Donovan faced off in Bay Ridge in front of a crowd of more than 100 people. The evening began with opening statements and then moved entirely to questions asked by the audience. Many were solid, meaningful questions even if they often made clear the questioner’s view on the answer. Here are a few observations on the candidates and the race, with video of the complete debate at the bottom of this post. Republican Dan Donovan and Democrat Vincent Gentile separately spoke with the press following the 11th Congressional District candidate debate Tuesday night. Many of the questions for Donovan, the Staten Island District Attorney, focused on domestic violence conviction statistics for his office. During the debate Gentile was critical of what he described as poor results by Donovan’s office. Donovan dismissed that criticism as misguided and proceeded to discuss some of the many challenges inherent in prosecuting domestic violence cases. I asked Donovan about Senate Republican delays on acting on the nomination of Loretta Lynch to be Attorney General. 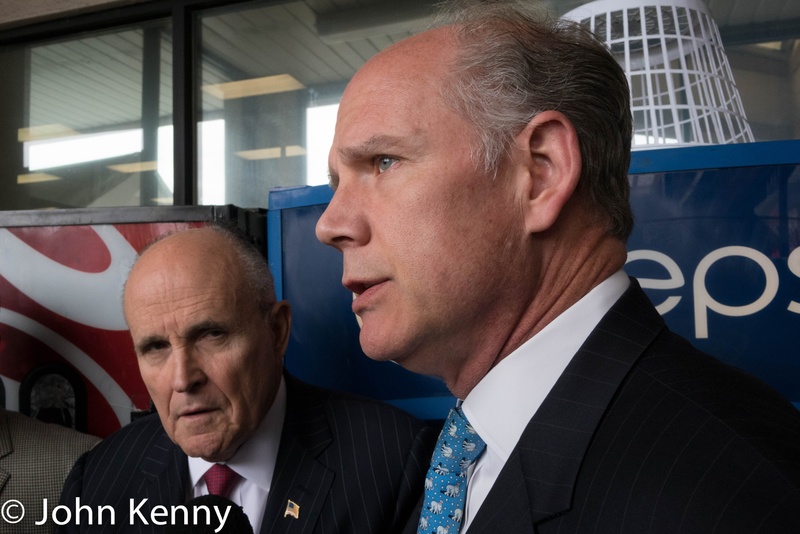 As the current U.S. Attorney for the Eastern District Lynch’s area of jurisdiction includes Staten Island. Donovan express unambiguous support for Lynch’s nomination. A final question addressed Sandy recovery issues. Question topics for Gentile included his criticisms of Donovan on domestic violence prosecutions and, in several iterations, how he would produce any meaningful results in a Republican-dominated House. The race to succeed Michael Grimm moved into a higher gear Tuesday evening as three candidates met for a sharp, sometimes raucous debate. 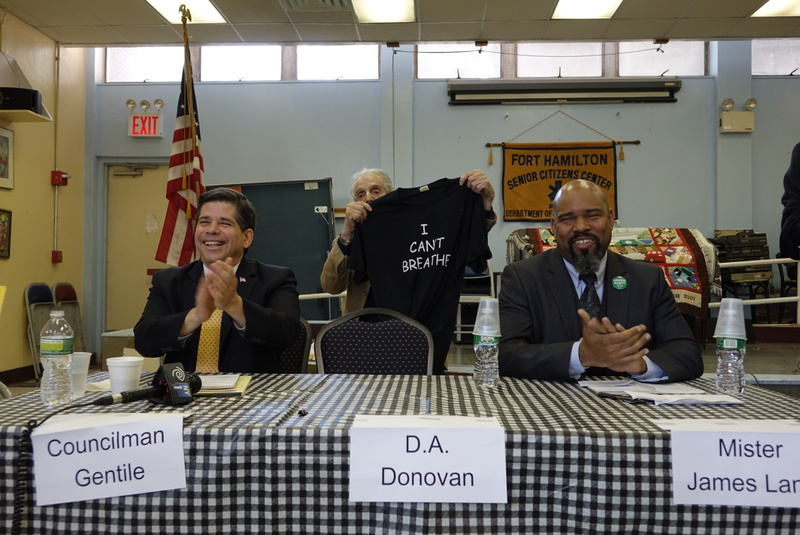 Democratic Party candidate Vincent Gentile, Green Party candidate James Lane and Republican/Conservative/Independence parties candidate Dan Donovan faced off in Bay Ridge in front of a crowd of more than 100 people. Here’s an additional clip from shortly after the episode shown in the clip above. The woman featured in the clip above moved to the back of the room, shouting and heckling the next questioner and the candidates. As this clip begins Green Party candidate James Lane is responding to the question in the prior clip. 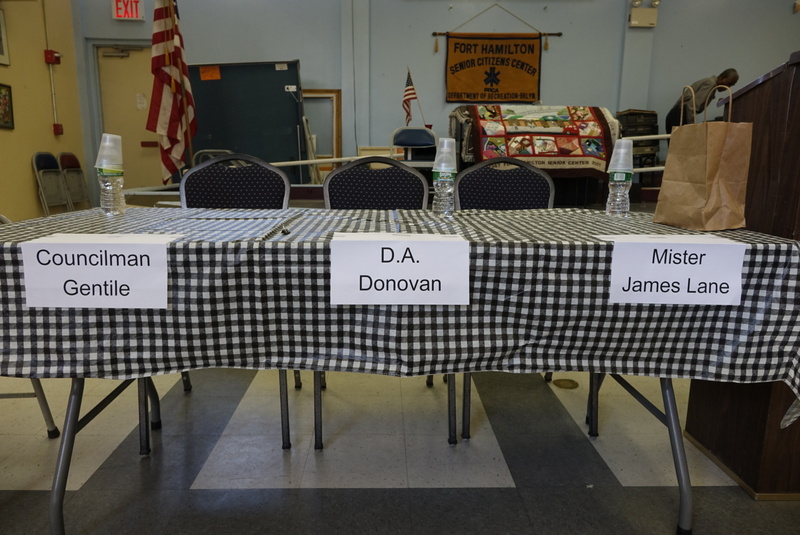 Congressional candidates Dan Donovan and Vincent Gentile separately answered questions at a Staten Island candidate forum Monday evening. With a little editing we present their head-to-head answers on a few select questions. The forum, sponsored by “The Middle Class Action Project“, featured the candidates in sequential appearances. Both candidates were asked an identical set of questions, heavily focused on manufacturing, international trade, unions and workers rights. The forum also had a candidate dispute over the format, with Gentile asserting that it was originally intended as a debate and was changed at Donovan’s insistence to separate, sequential appearances. Donovan’s staff insisted that was not true. The following video excerpts combine Donovan’s and Gentile’s respective answers to specific questions. The candidates were asked if they “support fast track trade authority”, both generally and specifically concerning the proposed Trans-Pacific Partnership. Both opposed fast track trade authority. Donovan expressed general discomfort, saying that “we shouldn’t fast track anything.” Gentile focused on the usurpation of congressional authority inherent in such fast tracking. Both expressed opposition to the TPP, although Donovan seemed less familiar with it, ending with a general statement that “all agreements … should be fair to America.” Gentile, who has sought to make the TPP a campaign issue, went through a list of reasons he opposes it.